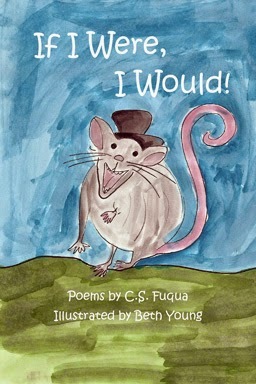 If I Were, I Would! Embark on fantastic adventures in a whimsical universe of poetry and art where everything is possible. Explore and celebrate the wonderful and diverse world through imagination! And if you see the authors there, wave! If I Were, I Would! is available in trade paperback, iBook, Kindle, Nook (Barnes & Noble), Kobo, and audiobook (Audible.com, Amazon.com, iTunes). The audio enhanced iBook, available from iTunes for iPad and other devices, features print-book layout and full read-along audio to assist in vocabulary expansion for young readers. Download an iBook preview with audio at https://itunes.apple.com/us/book/book-title/id916556775?mt=11. View the Youtube trailer at http://youtu.be/WccgaGyM3xs. Beth Young is an award-winning artist with an extensive background in commercial, creative, and instructional art. A specialist in Montessori Method instruction and certified in early childhood education, Beth is a full-time elementary school art teacher, affording her intimate knowledge of the types of illustrations that appeal most to young children. C.S. Fuqua’s books include Muscle Shoals ~ The Hit Capital’s Heyday & Beyond, Hush, Puppy! A Southern Fried Tale, the award-winning The Swing: Poems of Fatherhood, and The Native American Flute ~ Myth, History, Craft, among others. His poems and short stories have appeared widely in publications such as Main Street Rag , Christian Science Monitor, Chiron Review, Cemetery Dance, Year’s Best Horror Stories, and The Old Farmer’s Almanac. Get free fiction, poetry, music, and more by subscribing to the newsletter! Please enter your name and email address below. Thank you! Thank you for visiting. Please spread the word.